Dermatome is area of the skin that has supply by a single spinal nerve. The point of development of lower limb bud is on the venterolateral part of body wall that is opposite of L1-S3 sections of spine, afterwards these sections of spinal cord distribute nerves in skin of lower limb. Only ventral rami of spinal nerves distribute nerves in lower limb, because the lower limb develops from venterolateral part of body. The speromedial quadrant of glutal region is the only exception to this law, that has nerve distribution by rami of L1-L3 and S1-S3 spinal nerves. Initially the limb bud has cephalic and caudal edges termed pre-axial and post-axial edges, respectively. The great toe is along the pre-axial border and the little toe is along the post-axial border. The arrangement of the dermatome pattern is simple at this period; L1 spinal Nerve Supplys pre-axial strip of the skin and S3 spinal Nerve Supplys the post-axial strip of the skin. Afterwards the lower limb bud rotates medially by 90 °. Thus, the great toe comes to be located medially and the little toe is located laterally. 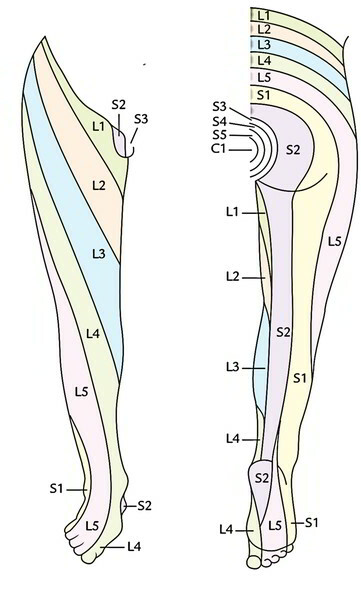 As a consequence, the dermatomes are ordered in a sequence, above downward (L1 L4) along the pre-axial border, and below upward (S1 S3) along the post-axial border. The middle 3 toes and adjoining area of the dorsum of foot and lateral side of the leg are provided by L5 section. As the limb elongates the central dermatomes (L4, L5; S1) are pulled in this kind of style that they’re represented only in thedistal part of the limb and are entombed proximally. The line along which the central dermatomes are entombed is termed an axial line. Segmental innervation of the skin of the lower limb. In cases of the paraplegia (paralysis of lower limbs) clinicians can discover the site of lesion in the spinal cord (sections L1 S3) by performing the sensory evaluation for pain, touch, and temperature. This is so because sensory loss of the skin following injury to the spinal cord conforms to the dermatome. The upper limit of the sensory loss (dermatome) signifies the level of lesion. Majority of the muscles are provided by greater than one section of the spinal cord however only a couple of sections innervate the muscle primarily. The damage of the prevailing section causes maximum paralysis. Segmental innervation of the muscles of the lower limb. The knowledge of these segmental worth is of clinical value in diagnosis of injuries of the nerves or to the spinal cord sections from which they originate. The 4 sequential spinal sections modulate the movements of a specific joint in the limb. The upper 2 sections modulate the 1 movement and the lower 2 sections modulate the opposite movement, for a joint 1 section distal in the limb, the middle (4 straight spinal sections) is located in block 1 section lower in the spinal cord. Segmental innervation of the joints of the lower limb.